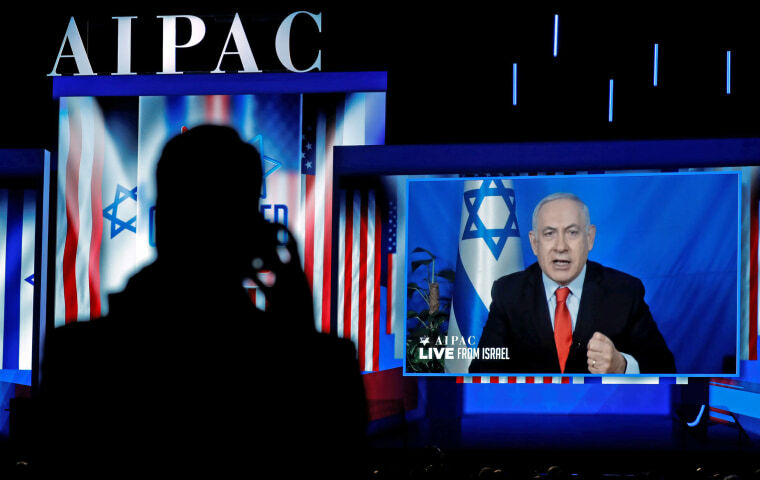 The prime minister of Israel made the comments during a satellite address to the AIPAC conference in Washington, D.C.
Israeli Prime Minister Benjamin Netanyahu hit back Tuesday against comments from Rep. Ilhan Omar, D-Minn., suggesting that the reason Israel is solidly supported by the U.S. government is because of money. "From this Benjamin, it's not about the Benjamins!" Netanyahu told the AIPAC conference in Washington, speaking by satellite hookup from Israel. "The reason Americans love Israel," he added, "is not because they want our money, it's because they share our values. It's because America and Israel share a love of freedom and democracy." Netanyahu's remarks were in response to a February tweet by Omar, who is Muslim, that American support for Israel was "all about the Benjamins baby." Weeks later, she said pro-Israel activists pushed for "allegiance to a foreign country." On Tuesday, however, she took a shot at Netanyahu, as well as President Donald Trump, telling NBC News that "the Prime Minister of Israel is the one that is aligning with right-wing leaders, somebody who is currently facing possible indictments for bribery and corruption, and he is meeting with a president that we know might be charged, or might face indictments for obstruction of justice." Netanyahu met with Trump at the White House on Monday. Later Tuesday, Omar criticized Netanyahu for focusing on her in his AIPAC speech instead of talking more about hate crimes and anti-Semitic violence. In a series of tweets, she accused Netanyahu of being "in an alliance" with the "'KKK of Israel'" and said she had "not criticized AIPAC because of its membership or the country it advocates for." "I've criticized it because it has repeatedly opposed efforts to guarantee peace and human rights in the region," she said on Twitter. Moments after Netanyahu spokes at AIPAC — he had been scheduled to speak to the conference in person but returned to Israel early after rockets were launched from Gaza — Senate Majority Leader Mitch McConnell, R-Ky., also addressed Omar's comments, saying that "for many years, such slurs and tropes were limited to the fringes." McConnell also attacked the several Democratic presidential candidates who skipped the conference after a prominent progressive group called on them to boycott the event. "I'm troubled that many of the declared Democratic presidential candidates seem to be avoiding this very gathering," McConnell said. "Apparently, because political partisans who have leveled scurrilous charges against this organization have warned they will be keeping watch, and they will be taking names." Sens. Elizabeth Warren, D-Mass., Kamala Harris, D-Calif., and Bernie Sanders, I-Vt., and Rep. Beto O’Rourke, D-Texas, as well as others, did not attend the event. Meanwhile, speaker after speaker at the three-day AIPAC conference referred to Omar before an audience of 18,000 who packed the Washington Convention Center, watching the proceedings from a dozen giant screens flanking the sage. House Speaker Nancy Pelosi, D-Calif., addressing the group on Tuesday, however, touted the anti-hate resolution she recently shepherded through Congress in response to the Omar controversy and condemned the "myth of dual loyalty" and the BDS movement (boycott, divestment, sanctions) as "bigotry masquerading as policy." Sen. Bob Menendez, D-N.J., the ranking member of the Senate Foreign Relations Committee, for his part, pledged support for Israel and also condemned Omar’s comments — but pushed back aggressively at GOP attempts to drive a wedge between Jewish voters and the Democratic Party. "I can't stay silent when the entire Democratic Party is castigated as Jew-haters when what we really need is leadership in a movement that unites this nation and the world against the rise of anti-Semitism, hatred and white supremacy and across the globe," Menendez said to applause. "This isn't about playing politics with anti-Semitism." “So, yes, when you imply that money is the only driving factor behind a strong U.S.-Israel relationship, you are fanning those flames,” Menendez continued, before taking a thinly veiled shot at Trump. "And just the same, when you accuse Jews of funding caravans of asylum-seekers at our southern border or fail to condemn the full variety of white supremacy at home and abroad, you are fanning those flames."